Visiting Thomas Sankara’s Tomb – mark jacobs lives! I shed a tear when I got there it was of the most emotional experience for me on somebody I never saw in real life, I cried because I was asking what will Burkina Faso/Africa look like if such exceptional leaders where not killed, with him our aspirations for better Africa was killed. 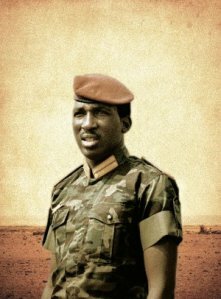 Who is Thomas Sankara, he is a charismatic revolution hero from Burkina Faso, the name he gave the country meaning “land of upright man”. He came to power at the age of 32 via a military coup to oust former dictator in what was know as Upper Volter. In the 4 years he ruled the country he made significant strides in improving the lives of people of Burkina Faso, in 4 years the country was able to feed itself, women where empowered and environmental degradation was reversed. What made Thomas Sankara more powerful was the simple life he lived as president, he sold all government Merc’s and used a modest Renault, he instructed all ministers to fly economy class, he used a bicycle to drive around the city.